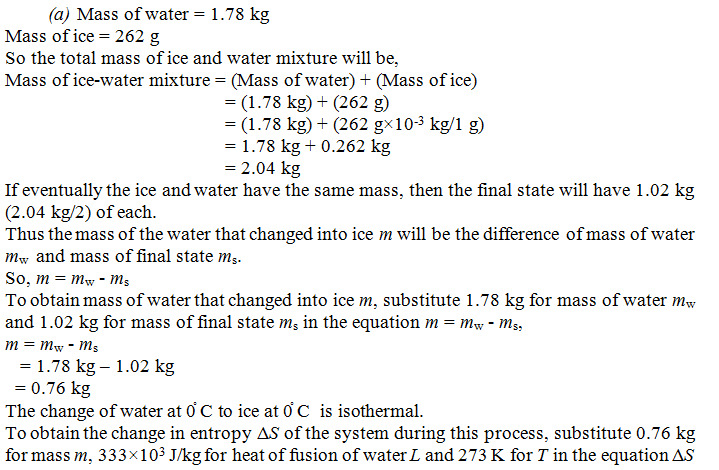 A mixture of 1.78 kg of water and 262 g of ice at 0ºC is, in a reversible process, brought    to a final equilibrium state where The water/ice ratio, by mass, is 1: 1 at 0ºC. (a) Calculate the entropy change of the system during this process. (b) The system is then returned to the first equilibrium state, but in an irreversible way (by using a Bunsen burner, for instance). Calculate the entropy change of the system during this process. (c) Show that your answer is consistent with the second law of thermodynamics. From the above observation we conclude that, the change in entropy ΔS of the system during this process will be -927 J/K. (b) Now the system is returned to the first equilibrium state, but in an irreversible way. Thus the change in entropy ΔS of the system during this process is equal to the negative of previous case. From the above observation we conclude that, the change in entropy ΔS of the system would be 927 J/K. (c) In accordance to second law of thermodynamics, entropy change ΔS is always  zero. From the above observation we conclude that, our answer is consistent with the second law of thermodynamics.